Percutaneous aortic valve replacement and percutaneous mitral valve repair are emerging alternatives for high-risk patients with severe valve disease. Interventional cardiologists are faced with the challenge represented by this complex procedure. 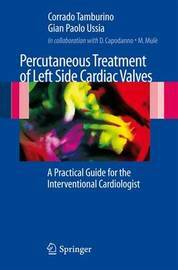 This practical guide specifically deals with a comprehensive knowledge of the techniques and approach to percutaneous treatment of left side cardiac valve disease and discusses the potential complications and expected or potential morbidity from the procedure. Corrado Tamburino is Professor of Cardiology and Director of both the Cardiology Institute and Cardiovascular Dept. and the Post-graduate School of Cardiology at the University of Catania. He is also Chief of the Cardiovascular Dept. at Ferrarotto Hospital, Catania. At present he is also President of the Italian Society of Invasive Cardiology (GISE). He introduced the technique of endomyocardial biopsy and mitral valvuloplasty to Sicily and has performed more than 12,000 interventional procedures of coronary angioplasty and coronary stent implantation. Prof. Tamburino was the first interventional cardiologist in Italy to implant a percutaneous aortic valve on patients who cannot undergo surgical interventions and the first who treated percuteneously mitral regurgitation. An interesting recent article published in CIRCULATION presents Prof. Tamburrino's career and experiences in detail (Circulation 2008; 118; f63-f66).